All Detecto Scales are tested with weights traceable to the U.S. Bureau of Standards. Rigid construction and precision engineering ensure an unbeatable, rugged product that guarantees accuracy and durability. 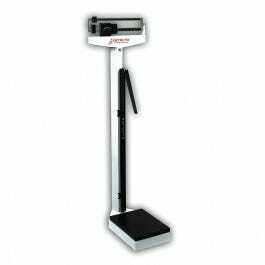 Die-cast, black on aluminum, easy-to-read beam makes weighing simple and fast. Weight Capacity: 400 lbs. x 0.2 lb. Height Rod Range: 30" - 78"
Foot Plate Size: 10-1/2" x 14-1/2"